Hunting is not just a pasttime for many, but rather a sport. And if you are passionate about hunting, you will surely understand the need to have a complete set of hunting gears to prepare you for your next trip. Any passionate and dedicated hunter has everything covered – from head to toe. Now, investing in the best hunting gear means that you will have not just the best guns and sights, but you also have top notch clothing, reliable pair of boots and of course, the best hunting socks. In order to choose the pair that suits you best, it is important that you conduct your research and start comparing brands and models to make the process easier and faster. 2 Why Do You Need Hunting Socks? 3 What to Look for When Buying Hunting Socks? Why Do You Need Hunting Socks? Hunting socks are socks especially made to support and ensure the comfort, as well as the safety of the hunters who wear them. Those who have good quality hunting socks understand that having the best pair of hunting boots is just half of the story. You need the right hunting socks to complete the package. Hunting socks are important to ensure that your boots will fit perfectly. When you try out your new boots, you wouldn’t know if you will be able to walk or run properly in them without a pair of good hunting socks (not ordinary, everyday socks) on. These socks are also important in protecting your feet, as well as keeping them warm and dry. We all know that hunting trips, sometimes, don’t go according to plan. Sudden rains, snow fall and even changes in the terrain can get your feet wet and cold. Hunting socks are designed to work as your insulation and shield against the outside weather and temperature, along with your hunting boots. A good pair of hunting socks will keep your feet blister-free. Your socks, along with your sock liners will keep your feet from rubbing too much against the insides of your boots. And though you have well-fitting pairs of boots, friction caused by the rubbing of the skin against your footwear can cause blisters – which can really be painful! What to Look for When Buying Hunting Socks? Hunting socks come in different types, and each kind depends on the cushioning, design and purpose. For warm weather hunting trips and for trekking along normal terrains, light hunting socks should be your top choice. For extra protection and for different weather and ground conditions, medium hunting socks are the best ones for you. Heavy and heavy-duty hunting socks are perfect for all-around protection. So for cold and wet weather conditions and for rougher terrains, these heavy hunting socks would work great. Durability. This is a really important quality. Or course, you don’t want to pay for something and wear it only to realize that the pair is not even strong enough to last a single hunting trip. In short, buy something that will last longer. Thermal features. One should look for hunting socks that can help keep the warmth in and the moisture out. Hunting socks should be thick enough for insulation – especially during the rainy and the winter seasons. Comfort. Your socks should be comfortable enough to help you walk, run, climb and leap without causing friction, pain or discomfort. The best hunting socks can keep your feet warm for 10 hours or longer. Thickness. When buying a pair of socks for hunting, think about the weather conditions and the season before making any decisions. Now, if you will be hunting during warm and dry weather, you can go for thinner and lighter hunting socks. As for hunting animals in the winter, choose the thicker ones to help keep your feet warm. Hunting socks are usually made of different types of fabric and materials. But the best socks in terms of comfort, are usually made of wool and silk. The fibers may be woven with different other materials such as synthetic fiber, nylon, lycra, polyester, acrylic and even cotton – to ensure your safety, protection, provide warmth and keep the moisture out. 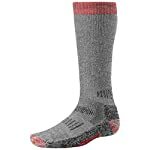 Made of 67% Merino wool, 32% Nylon, 2% Lycra- Spandex, Darn Tough Men’s Merino Wool Hiker Boot Sock Full Cushion Socks offer warmth, comfort and protection without busting your budget into pieces. These socks are perfect for those quick hunting trips, hiking and trekking adventures on dry or semi-wet terrains or hunting paths. These are thinner and lighter, making it breathable and comfortable in warmer weather. And despite its lighter features, your feet will still feel safe because the socks have a dense layer of cushioning – from your shin to your toes. It’s elastic-arches hug your ankles for full support without affecting your movement. The socks have what they call reinforced heels and durable ribbing. These features simply mean that you can forget about your socks bunching up on your toes and the top part sliding down your legs. Worried about not finding the right pair of socks for your winter hunting trip? Well, worry no more because you can easily grab a pair of Smartwool Hunt Extra Heavy OTC Socks and you are set. This pair of socks is specifically designed to keep its wearer’s feet warm and dry at all times. The socks have extra cushioning or lining around the calves. These also hug the feet to get that snug and comfortable feel. You can feel better knowing that your socks will not bunch or fluff up due to constant use. The socks are also designed to make it breathable and easier to dry. And because of these features, the socks will not retain odor and dirt. The socks do not feel heavy and uncomfortable, even though they are thicker compared to other types of hunting socks. Looking for a really strong pair of hunting socks that’s easy on the budget, flexible and reliable? FUN TOES 3 pairs thermal insulated 80% merino wool socks can be considered one of the brands that you should strongly consider. Made with 80% wool, 15% Nylon, and 5% Spandex, you can be sure that these socks have the perfect combination of comfort, warmth, and protection. This pair is great for regular or normal hunting environments and even for hunting during extreme weather conditions. The socks are well cushioned to ensure a snug fit even after several washings. The toes are also reinforced for more protection. This brand and model is a mid-weight type of hunting socks. Simply put, the socks, although they are thick enough to keep your feet warm in the winter, they feel lighter and softer. So for your next hunting trip, be sure to include this in your must-have hunting gear. Your hunting kit will not be complete without the best hunting socks for your feet. And through research, as well the tips that we have provided and our top 3 choices, you will soon find out that finding the perfect pair of hunting socks is not difficult at all.